Veeam Backup for Microsoft Office 365 v2: SharePoint and OneDrive support is here! Microsoft Office 365 adoption is bigger than ever. When Veeam introduced Veeam Backup for Microsoft Office 365 in November 2016, it became an immense success and Veeam has continued building on top of that. When we released version 1.5 in 2017, we added automation and scalability improvements which became a tremendous success for service providers and larger deployments. Today, Veeam is announcing v2 which takes our solution to a completely new level by adding support for Microsoft SharePoint and Microsoft OneDrive for Business. Download it right now! By adding support for SharePoint, Veeam extends its granular restore capabilities known from the Veeam Explorer for Microsoft SharePoint into Office 365. 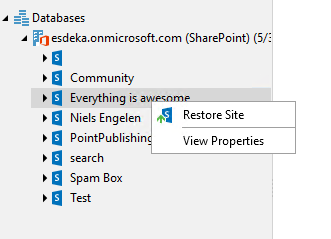 This allows you to restore individual items – documents, calendars, libraries and lists – as well as a complete SharePoint site when needed. 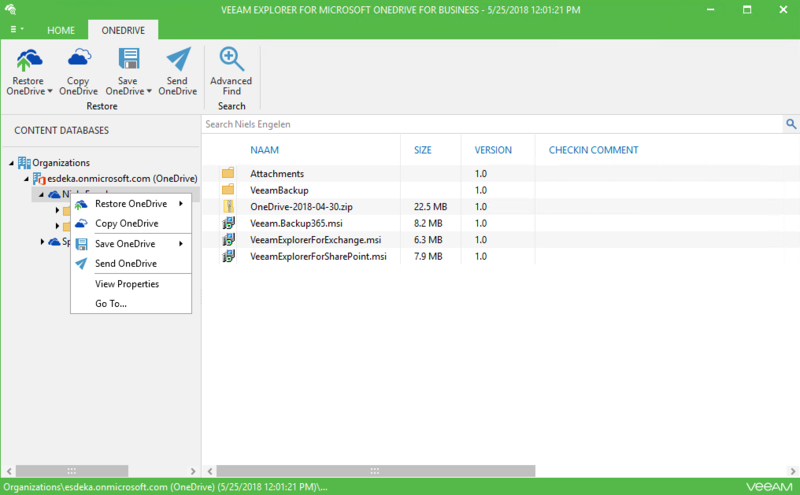 With the new release, Veeam can also help you back up your data if you are still in the migration process and are still using Microsoft SharePoint on premises or running in a hybrid scenario. The most requested feature was support for OneDrive for Business as more and more companies are using it to share files, folders and OneNote books internally. With Veeam Explorer for Microsoft OneDrive for Business, you can granularly restore any item available in your OneDrive folder (including Microsoft OneNote notebooks). You have the option to perform an in-place restore, restore to another OneDrive user or another folder in OneDrive, export files as an original or zip file, and if you get hit by a ransomware attack and your complete OneDrive folder gets encrypted Veeam can perform a full restore as well. Besides the introduction of new platform support, there are also several enhancements added. Major ease-of-use and backup flexibility improvements with a newly redesigned job wizard for easier and more flexible selection of Exchange Online, OneDrive for Business and SharePoint Online objects. Making it easier than ever to set-up, search and maintain visibility into your Office 365 data. Granularly search, scale and perform management of backup jobs for tens-of-thousands of Office 365 users! Restore data located in Microsoft Teams! You can protect Microsoft Teams when the underlying storage of the Teams data is within SharePoint Online, Exchange Online or OneDrive for Business. While data can be protected and restored, the Teams tabs and channels cannot. After restoring the item, it can however be reattached manually. Compare items with Veeam Explorer for Microsoft Exchange. 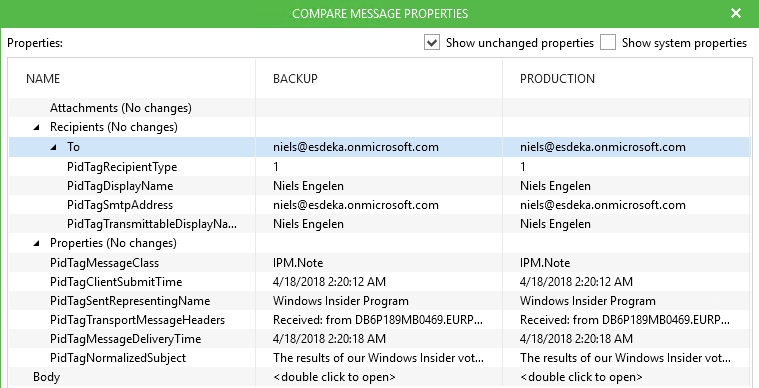 It is now possible to perform a comparison on items with your production mailbox to see which properties are missing and only restore those without restoring the full file. As with the 1.5 release, everything is also available for automation by either leveraging PowerShell or the Restful API which now fully supports OneDrive for Business and SharePoint. Another enhancement is the possibility to change the GUI color as you like. This option made its way into Veeam Backup for Microsoft Office 365 after being introduced in Veeam Backup & Replication. 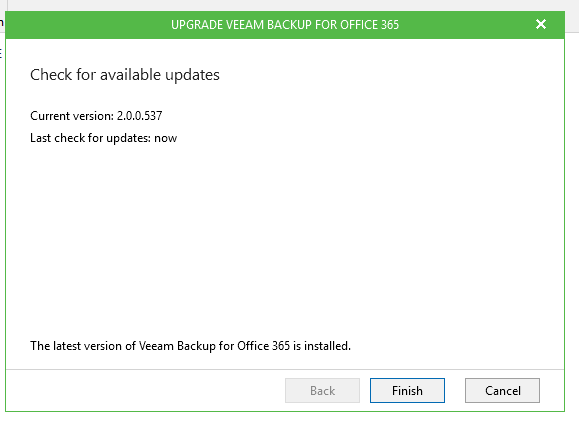 Starting with version 2, Veeam Backup for Microsoft Office 365 is now able to automatically check for updates, so you can rest assured you are always up to date. And finally, the log collection wizard has been updated as it now allows you to collect logs for support in case you run into an issue, as well as configure extended logging for all components. Niels Engelen (vExpert, VCP-DCV, CCNA, VMCA) is a Global Technologist for Veeam Software. Niels is a blogger and active member of the virtualization community. He has over eight years of IT experience, mostly focusing on virtualization, automation and cloud technologies.